The first presidential debate is tonight, and you can watch it for free. But for journalists piling into Hofstra University, the price of doing business has gotten steeper. As per Hofstra’s media rate sheet, a simple wi-fi connection for press will cost $200. Word first got out when two journalists from Vocativ noticed this seemingly ridiculous fee. Want a phone line and a (presumably) faster ethernet connection? $600. How about connecting an unlimited number of wireless devices? That’ll be $3,500 thank you very much, and please remember to make those checks out to Hofstra. 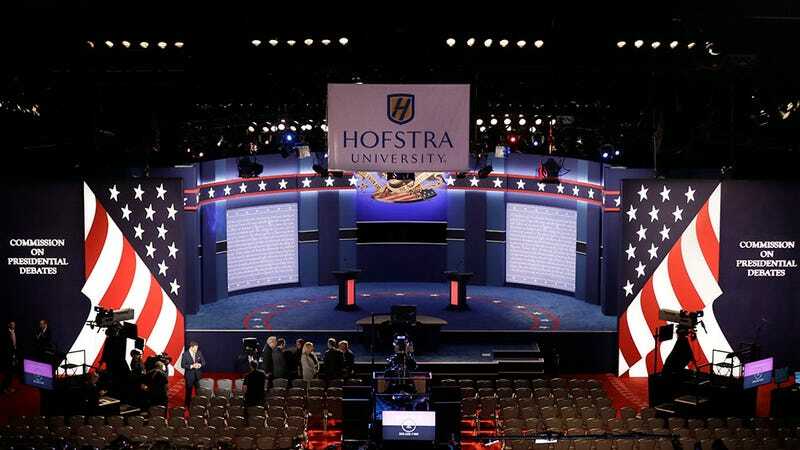 Of course, this is largely business as usual for debates, although services and rentals have gotten more expensive since Hofstra hosted the 2012 debates. Some media outlets have bigger needs and cash to burn, so shelling out for furniture rentals, expensive internet, or just a $75 chair to sit in comes with the territory. But for any small-time bloggers looking to save a couple bucks, Slate writer Jim Newell broke some sad news. Newell added that Hofstra’s enforcement of the no-dongle policy is uncertain, and it may in fact be illegal. A little over a year after the FCC determined that companies blocking wi-fi hotspots is “patently unlawful” if it forces people to pay astronomical fees to access the internet. We’ve reached out repeatedly to Hofstra and the Commission on Presidential Debates and will update if we hear back. Update 9/26/16 7:18pm EST: A tweet from Politico’s Kenneth Vogel claims the press area is being searched for wi-fi hotspots using these nearly $2,000 devices. (Presumably at least a dozen of them, based on the “aircheck 12" sticker?) Those poor dongles never stood a chance. Vogel told Gizmodo in an email the wi-fi testers are being employed by CPD and that, “if people refuse to turn off their hot-spots, CPD representatives will be summoned to explain that, if they don’t comply, their credentials will be revoked,” according to a CPD technician he spoke to. He added that he’s unsure how the $200 paid wi-fi service is limited to being limited to 5 devices per purchase, though one of our commenters—GweetPotato20—thinks it might be related to whitelisting specific MAC addresses. Update 9/26/16 7:31pm EST: It would appear this very expensive wi-fi was not equipped to handle the network load. Who would have thought.